Collect all of the horses from the all-new DreamWorks series Spirit Riding Free! Each of the 12 horses is 1:32 and approx 3" tall in scale, making them wonderful for collecting, as well as for goodie bags or stocking stuffers. 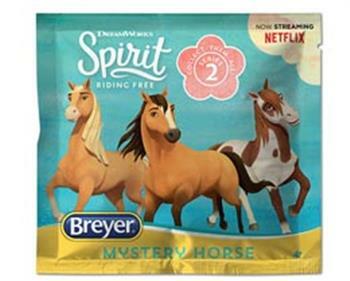 Perfectly sized for take-along play, collect them all to create your very own Spirit Riding Free herd! Each order will contain one Spirit Blind Bag, shipped randomly. Open your bag to find out which of the 12 Spirit Riding Free characters you're adding to your collection! Characters are: Spirit, Boomerang, Chica Linda, Bubblegum, Xerxes, Junipero, Senor Carrots, Hacheta, Sorrel, Sagebrush, Tomahawk, and the Golden Spirit chase piece. Pieces picked at random. If you order 12 you will get the whole unopened box.